WWII draft cards from the Fourth Registration, often called the "Old Man's Draft," because it registered men who were 45 to 64 years old at the time. Each card contains the registrant's name, age, birth date and place, residence, employer, and physical description. After Pearl Harbor, the U.S. initiated a draft that reached beyond younger age groups. This registration was not intended to be used for military service, but to provide a complete inventory of manpower resources that could be used for national service. 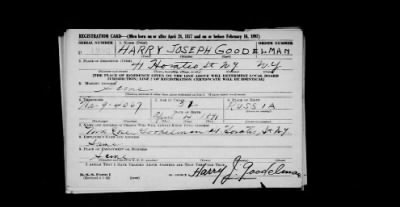 Registration on April 27, 1942, included men not already in the military who were born on or between April 28, 1877, and February 16, 1897.